in the past, i've gone on about how hard it is in the current comics market, for any book NOT published by the big 2 to have any kinda presence on the shelves. with cross-overs galore and all the ad space being monopolized by marvel and dc, its tough for ANYBODY to get noticed! right, todd--we've heard it before, blah, blah, blah...but this time i'm not talkin' about the perhapanauts. there are tons of other books; small press, independent, call it what you will, clever, unique, innovative stuff, that are drowning out there in a sea of same old, same old. i go through previews each month and skirt the dc section (well, i do go back and look--i still LOVE these characters after all and i still read some of their books) but my first priority is to see all the new stuff, the personal stuff, the passionate stories/comics that are just DYING to be looked at in the independent section of the catalogue. this is where most of my actual ordering comes from--trying out something new, something that's caught my eye, something fresh...marvel and dc are gonna be fine if i decide to spend my wampum on true story, swear to god instead of civil war: part 29. or electric girl! or e-man:recharged! or death jr! or empty chamber! this book is gonna get eaten up. in the current climate, sadly, a gem like this will be overlooked by far too many people. the industry these days is all about hype. (well, really, these days, what ISN'T?) and if you don't have the money or the corporate support team to build that hype, you're gonna get lost in the sauce. but enough about the biz--that just makes me frustrated. i've read this book. well, the first issue. jason was kind enough to send me a preview copy a month or so ago and i really dug it. it's a great little thriller and from page to page i wasn't really sure what was unfolding in front of me. empty chamber is the kinda tale that invites you in...and then slams the door behind you once you're over the threshold. played out like a movie, it begins 'in medius res', and i don't know who are the good guys, who are the bad guys, who's that girl, where'd THAT guy come from. how do i know? 'cause two months later i still find myself thinking about it, wondering, from time to time, what's gonna happen? how are they gonna get outta THAT?! i'm not saying stop being a marvel zombie. That looks like an interesting book. I'll check it out. Did it come out yet? And I second your encouragement of reading independent books. Everyone should look on the second shelf at your LCS. You know, the shelf below DC and Marvel stuff. There are amazing books there. Far more imaginative, and you don't put those books down, going "What the F---!!! _____-Man would never do that. ARGH! and that character was killed off 30 years ago. Why is he back?" A. Dave is one of the good guys in the biz to boot. 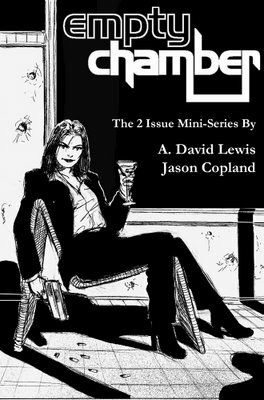 I haven't yet read Empty Chamber, but it looks cool. My friend and protege, Jenn Rodgers, colored Dave's Lone and Level Sands, which is up for a few Harveys this year! Now is a good time to check out what A. David Lewis has written. He's going to blow up! Todd - Thanks you so much for the kind words about the book. Yeah, I'm sure that EMPTY CHAMBER will go overlooked by 98% of the comic book readers. But, as long as those 2% like the book, I'll be a pretty happy guy. Scott - Thanks for you interest in EC! The first issue is in this month's Preview catalogue, so your order for it (if you were to order it, that is (no pressure ;D)) should be into your LCS before the end of this month. I suggest preordering it because the chance of your LCS ordering it will be fairly small. Rich - Yeah, ADL is a great writer. I first worked with him on his Mortal Coils book. Great stuff. And did you know that Jenn is doing the grayscales for EMPTY CHAMBER, as well? She's doing an amazing job! Hopefully, you give the book a chance. Thanks to everyone for giving EMPTY CHAMBER a look! A. Dave and I truly appreciate it. If you haven't seen her work, check it out! But...Todd.....Spiderman took his mask off and Speedball almost died. Are you saying I shouldn't buy all 8,000 issues of Spidey/Civil War? I mean, what about poor Speedball??? P.S. Thanks for the kind (commiserate) words, Todd!